I decided to forward this from my tumblr, for those that would like to comment on the entry. As I’m sure you are aware, we are currently running a fundraiser through indiegogo for the printing of Amya’s third issue. We are now over 100% of our goal our goal, which is incredible! I can’t thank everyone enough for the tremendous support we have received. As part of the campaign I promised to do weekly updates through various media, and invited readers to send in question they would like to see discussed. Initially I was going to make a video about this, but due to my recent surgery I thought text would be better. When designing Faye – I wanted to create a challenging character. For those that don’t already know the story, Faye is a mute spell-caster who is thrown into an adventure with a group of new friends that don’t really know what to make of her sign language and lack of speech. Apart from when there is pen and paper on hand, she is not able to communicate to them through words. Because of this lacking element, we need to rely heavily on the artistic side of the comic to visually articulate what she is feeling. However, seeking a challenge wasn’t the only reason I created Faye this way. When writing I tend to project a bit of myself onto my characters. It makes it easier to relate to and humanize them. When I was young, I was diagnosed with a central auditory processing disorder. Though I could hear, my brain could not decipher what I was hearing. I did not learn to speak or speak properly for some time, and even when I did learn communication was still very awkward through my youth. Even to this day I rely heavily on lip-reading, as my mind becomes too confused to make out words if there is too much noise in the background. Much like Faye I went through a good portion of my life in silence. And likewise I turned to reading and writing as a way to escape from the world, and as a communication tool. Faye is non-verbal, but she is hearing – and does not have the same disorder that I was born with. There will be other explanations in regards to her lack of voice as the story continues. That really summarizes why I decided to make Faye non-verbal; so onto the next question. How do I think Faye’s silence effects the story? I think it impacts it in a few ways. Mainly – how the other characters interact with her, and how she is perceived by the party as well as readers. Faye has a lot of strength – but she hasn’t had a lot of opportunity to showcase it as of yet. 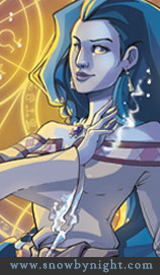 The other characters to some extent have associated her disability with the idea that she should be a non-participant. But this is not the case. Often when we first meet someone with a disability, we focus on what they can’t do and not what they can. Faye really isn’t limited at all. She can communicate and hold conversations through sign language, gestures and touch, writing and body language. It is the world’s understanding of her communication attempts that is limited. If you have ever gone through Disability Sensitivity training in your workplace, you likely have a good idea of the common mistakes people often make when interacting with an ‘impaired’ individual. Making assumptions rather than asking, forcing aid, speaking to a third-party rather than directing attention to the individual, and so on. A lot of this can be avoided by common sense; however, I like to think they can be avoided by remembering one simple thing – that they are a normal human being. A human being that has found alternate ways to maneuver the world and communicate when faced with great challenges. As the story continues you will see the group overcome some of these issues; and I believe as the story progresses the perception of Faye will change greatly among the readers. My journal entries tend to be rather scattered as I write as thoughts come. So if this post has seemed fragmented due to it, I apologize. My intent was to write this in my journal entry format, rather than turning it into an essay. As a result I try to communicate non-verbally whenever possible. It gets the point across. You write Anya’s story very well. And for that archer, Harsh tutor. I’ve forgotten the official name but I was born with “glue ear”. That was corrected by an operation but even now I find it hard separating foreground noise from background noise. It’s even more frustrating for me because my hearing is more sensitive than the average person. When I was a student I could hear every buzzer in the building when the people on my corridor often couldn’t even hear our own. When we were very young we had a few lessons about disability and interacting with disabled people. Some of it must of stuck because my ex, who happens to be blind, was surprised that I didn’t make many of the common mistakes that people do when interacting with a blind person. On the story, I just saw Amya’s muteness as just another part of her character. Her strength does show through simply because she was able to ask relevant questions/make suggestions soon after a distressing incident. To be able to think and plan when faced with terrifying situations shows a measure of calmness. Come to think of it, to realise the only exit is the window and to enact that plan shows a lot of determination.